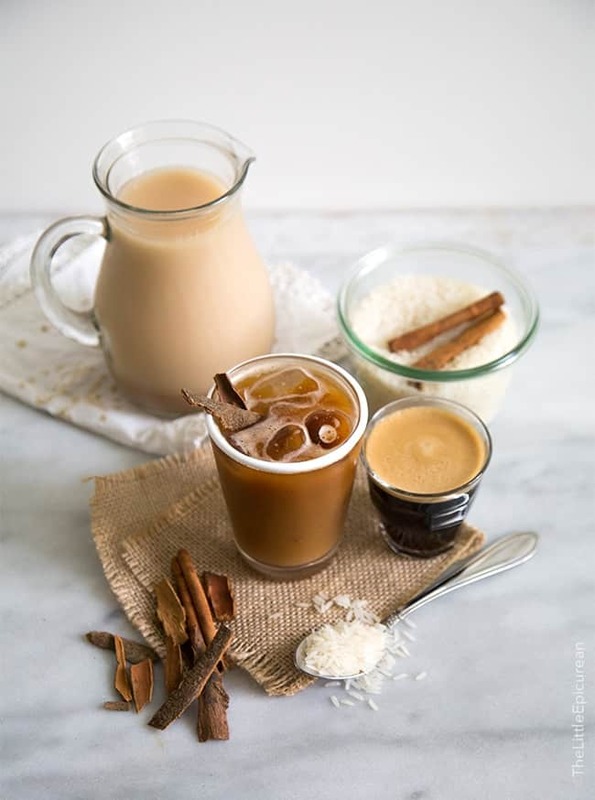 Horchata latte is made by mixing homemade cinnamon rice milk with a shot of espresso. Horchata Latte. My summer is all about Horchata Latte. During the warmer months, many coffee shops come up with all sorts of iced specials to helps cool down customers. I first learned about this marvelous combination last year. Cafe de Leche in Highland Park serves horchata con espresso year round and it is amazing. (And double points because they serve Stumptown Coffee!) I used to frequent Cafe de Leche more often when I lived in Silver Lake, as it was just a jump and skip away. Ever since moving to Pasadena, I’ve haven’t found a similar drink until now. 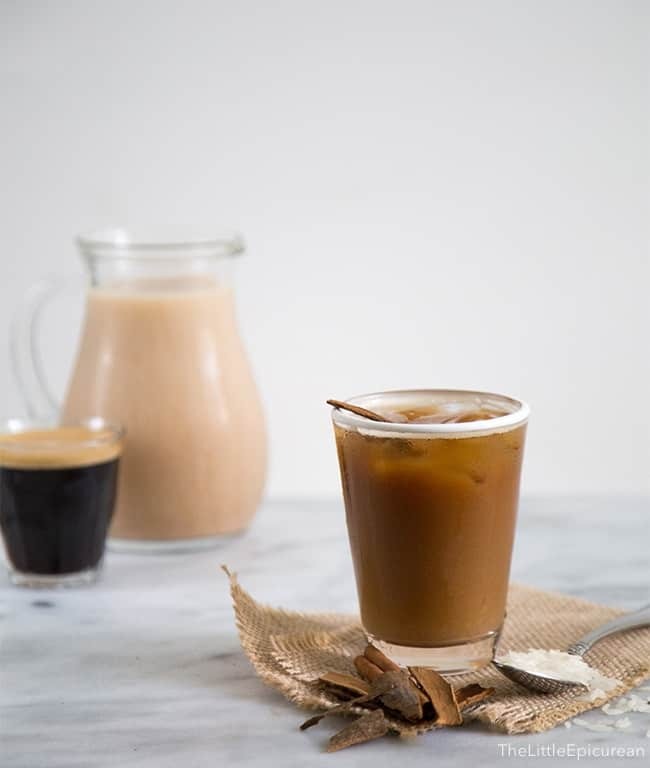 Last week I found out that my new go-to shop Jameson Brown Coffee Roasters recently starting making iced horchata lattes. My heart skipped a beat when I first saw the sign. Of course I ordered it and I was immediately satisfied, relieved, and caffeinated. It was ridiculously delicious. And then I thought, I need to make this at home. Jameson closes surprisingly early at 7pm. What if I need my fix after dinner?! Who knows when a horchata latte craving might strike. For that reason alone, it’s better I have my kitchen stocked and prepared. Dairy free. Soy free. Vegan. Vegetarian. Gluten free. Nut free. You name it. This horchata latte fits any dietary restriction. Dairy free makes me super happy. I always have a week’s supply of Lactaid pills in my purse at all times. You would never guess that I’m lactose intolerant based on the amount of ice cream I consume. I tend to stay away from lattes and other dairy drinks for fear of unwanted bloating, vomiting, stomach pains, etc. 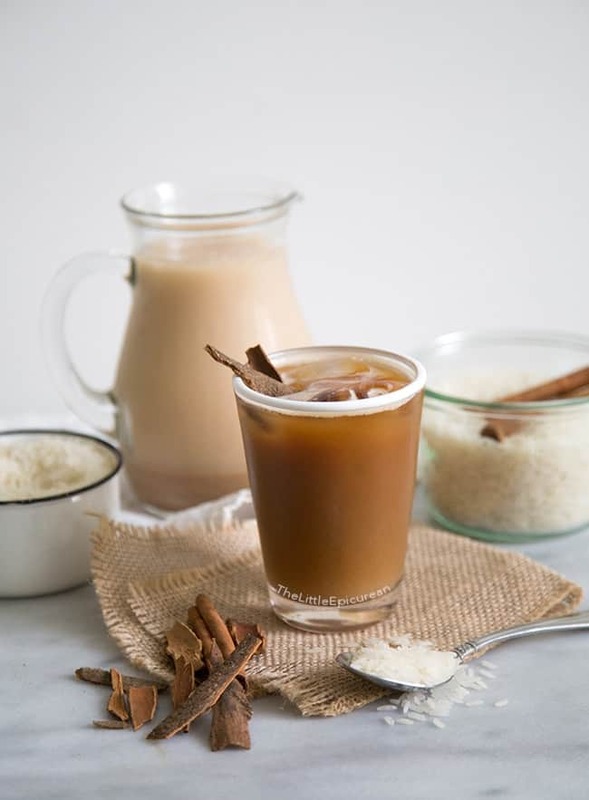 Horchata is very simple to make. 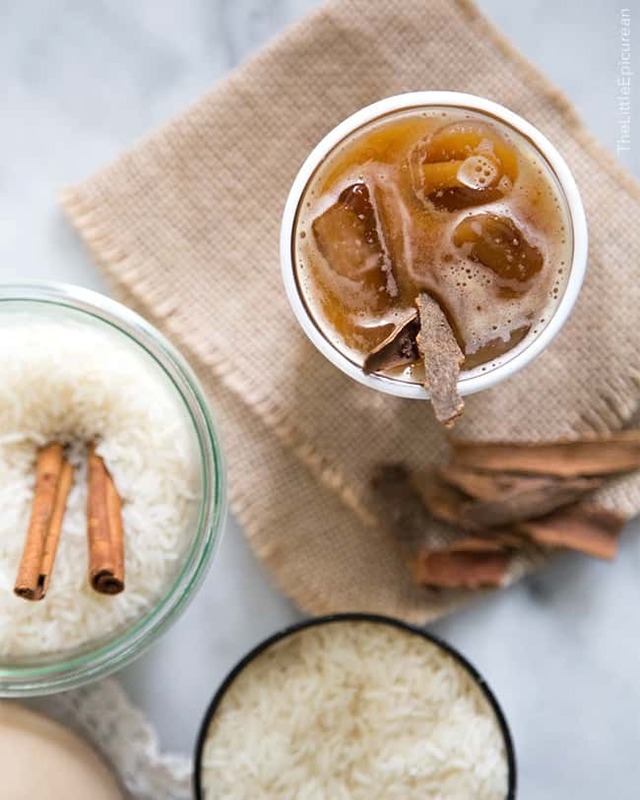 For this version, all you need is rice, water, cinnamon bark and sugar. There are countless variations that differ according to region and country. Some are made with ground almonds, sesame seeds, and even barley. I like mine super cinnamon-y so I used a LOT of cinnamon. I prefer to use cinnamon bark (canela or ceylon cinnamon) as it breaks down a lot easier. I also find that is it slightly sweeter and more fragrant than the cinnamon sticks (cassia cinnamon) sold in glass jars at the supermarket. Cinnamon bark tends to be much cheaper. You can find it at Latin and Asian markets. It will usually be sold in bags alongside dried peppers and other dried spices. Skip the iced coffee and try something new and exotic. If you love cinnamon, this is the caffeinated beverage for you! Since horchata is already sweet, no need to add extra sugar to this latte. 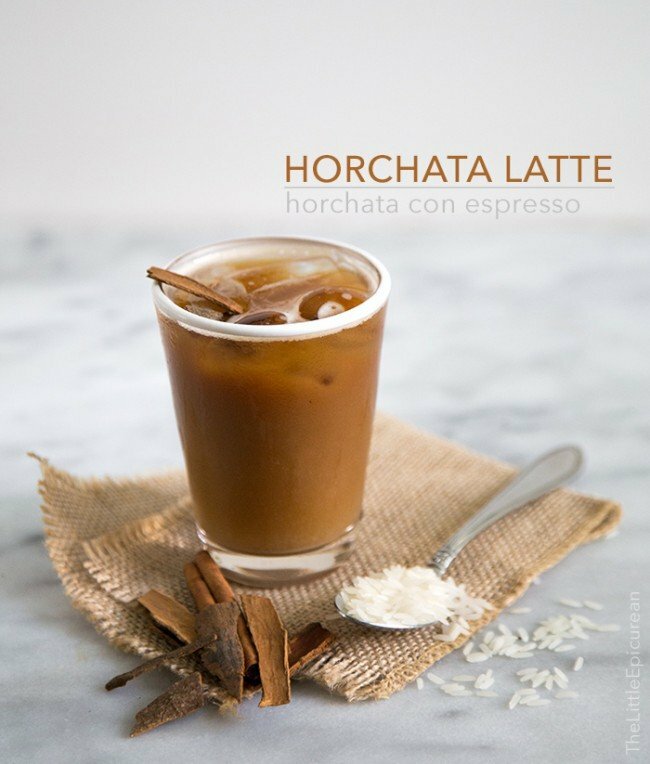 Make yourself a horchata latte and make iced horchata for the kids! And if you happen to have too much horchata, go ahead and freeze them into popsicles! Fill serving glass with ice. 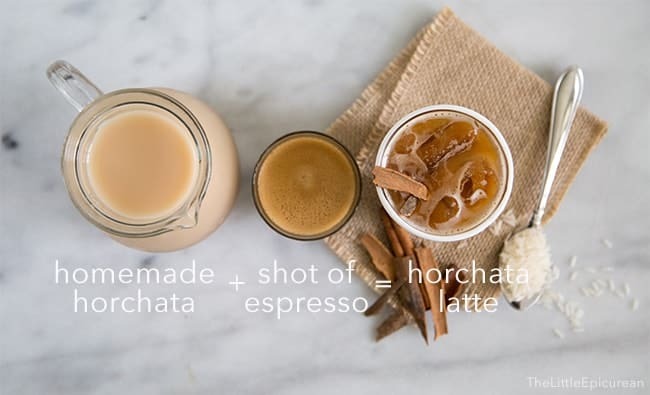 Add chilled horchata and espresso. Stir and enjoy. Add rice, cinnamon bark, and 3 cups water to blender. Blend until rice is broken down like coarse, pebble-like sand. Pour mixture into a large container. Add remaining 3 cups water. Stir to combine. Cover and let sit at room temperature for 3 hours. In small batches, return mixture to blender. Blend once again until rice and cinnamon bark is further broken down into smaller bits. Strain mixture through a very fine sieve, or cheesecloth. Add 3/4 cup simple syrup. Stir to combine. Store in the fridge to chill. Once cold, stir mixture and taste. Add more simply syrup, if necessary. Serve chilled over ice. In a sauce pot, bring water and sugar to a boil. Boil until sugar has dissolved. Remove from heat and allow to cool to room temperature. Love this styling and it looks amazing! This looks delicious and I’m so happy to find a naturally dairy free “latte”! You mention espresso in the ingredients, but it doesn’t make an appearance in the directions. One can only assume it gets added to the hot hats at the “serve chilled over ice” part. Well done! I will try this soon!